From Genesis to Revelation, whenever the word SEED is used, the tendency of many of today’s prosperity preachers is to teach that God metaphorically is comparing money to a SEED. While a person’s money could become a sown seed, as could someone’s time, spiritual gifts, natural talents, love, joy, forgiveness, and so forth, the Divine Truth is that the biblical “seed” subject is much deeper than the financial prosperity aspect of the subject. In fact, the biblical SEED that God says is sown during seedtime actually describes the nature of God Himself being sown! Without doubt everything Father God created in the beginning He created with His spoken Word and by the power of His Holy Spirit. Father God spoke and His Spirit hovered (brooded, moved, hatched, or produced). The results of the collaboration between God’s spoken Word and His Holy Spirit are: Heaven, Earth, light, day, night, dry land, seas, years, seasons, Sun, Moon, stars, vegetation, animals, human life, and so forth. More to the point is the fact that, throughout the entire Word of God, Father God continually teaches that His Word always works just like the eternal spiritual SEED that it is. For instance, both a natural seed and the spiritual Word of God go through a germination process. Both germination processes cannot be avoided. Then too, both germination processes take a while to complete. God additionally teaches in His Word that inside of everything and everyone He has created is some aspect of His SEED—the eternal spiritual SEED that in its infinitesimal form has all the characteristics and capabilities that anything and anyone God has created, whether natural or spiritual, would ever need. Moreover, in His inspired Word God teaches that, along with speaking everything and everyone into existence, God also instantaneously established some biblical seed principles that apply to every seed that develops from God’s original creations. One important seed principle is that every seed produces after its own kind, which means that whatever has been harvested always depends on whatever kind of seed has been planted. Indeed, in the Old and New Testaments, God repeatedly proclaims: You reap what you sow (cf. Galatians 6:7)! Another significant seed principle is that every seed has a built-in capability to reproduce itself, which means that a seed is an encapsulation of the life that will mature, cultivate, and indefinitely sustain its existence. As God declares in His Word, the seed is in itself (see Genesis 1:11). Now, if a seed always produces after its own kind, then from the beginning of Creation God has proven that not only has every kind of natural seed (flower seed, grass seed, fruit seed, tree seed, seed of a man [children], etc.) produced after its kind, but also He has proven that every kind of spiritual seed (seed of a woman [Christ Jesus the spiritual seed of God], Body of Christ [spiritual seed of Christ Jesus], every ekklesia [every spiritual community of believers], and so on) produced after its own kind, too. 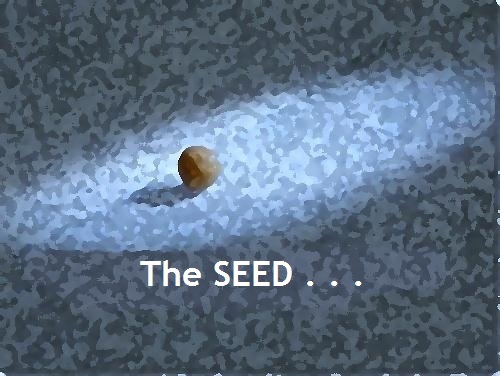 This seed principle is why, from Genesis to Revelation, whenever SEED is used it is referring to the power of the everlasting Holy Spirit of God who not only produces from God’s spoken Word (SEED) both natural and spiritual existences, but also causes every living thing and living being to grow naturally and/or spiritually. Where the second seed principle is concerned, from the foundation of this world, God has proven that His Word SEED always has been inside everyone and everything that has ever lived upon this Earth. God always intended that, just like God’s eternal spiritual SEED has Its Life contained within Itself, every created seed kind, no matter if it is natural or spiritual, also is self-sustaining and self-perpetuating. In other words, Father God made it so that every living “thing” and every living “being” could produce more living things and more living beings. The Divine Truth here is that Father God forever is the Word SEED—He is always the Holy Bible’s metaphorical SEED. This Divine Truth also means that Father God eternally has had the Word SEED with Him. The apostle John says it better, when he writes: “In the beginning was the Word, and the Word was with God, and the Word was God” (John 1:1, KJ21). Since the SEED is the Word of God, then John 1:1 also can be translated or interpreted as follows: In the beginning was the SEED, and the SEED was with God, and the SEED was God! Put differently, the SEED, the Word of God, and Father God are ONE in the same. This Divine Truth is the reason why seedtime and harvest, night and day, the seasons, mankind, the Body of Christ, the Lord Himself, and so on, will remain as long as there is an Earth. They all endure because they all were created from one eternal spiritual SEED—the spoken Word, which also is God the Father. Since God is His SEED (both singularly and plurally speaking), God therefore has planted or sown Himself. By doing so God naturally and spiritually has reaped, and will continue to reap, what He spiritually has sown (both singularly and plurally speaking). This Divine Truth is why God not only expects His SEED always to produce after Its own kind but also He expects all of the many natural and spiritual seeds that exist because of His SEED to produce continually after their own kind. For this reason, no matter if there are many men and women who preach and teach a prosperity Gospel instead of this Divine SEED Truth, which clearly proves the sown SEED is never specifically about money, there is no truly believing and trusting in what Christ Jesus preaches and teaches man or woman who can deny that the Lord preaches and teaches about what the sown SEED absolutely means. Through Christ Jesus’ SEED parables, believers learn that the Word of God (literally the Holy Bible and figuratively Christ Jesus the spiritual Son of God; or SEED) definitely describes how followers of Christ Jesus (believers in Christ) receive a continual and generous harvest, despite whatever they might be facing. Christ Jesus’ SEED teachings make it clear that a continual and generous harvest only happens when people sow continually and generously. What the Lord specifically teaches in His SEED parables is that just like God’s spoken (sown) SEED Word has Life in It, the words (seeds) that humans speak (sow) also have life in them. This Life in the Word SEED idea is found in other biblical passages as well, like when Christ Jesus says: “…The words that I speak unto you, they are spirit, and they are life” (John 6:63, KJ21). Just before these words are spoken, Christ Jesus also teaches that He Himself is the living Bread from Heaven (the Bread of Life from Heaven) that has been sent to Earth to give eternal Life (see John 6:48-58). Concerning Christ Jesus’ SEED parables, in the Parable of the Sower, for example, the Lord teaches that the sower ALWAYS sows with alive SEED—that the sower sows with the living Word of God (the Logos or inspired, spoken Word of God). Christ Jesus of course is referring to Himself as being the Sower of the Word of God. As the Sower, the Lord has the power and authority to know what unequivocally determines whether or not the hearer gains a continual and abundant/generous harvest that can be either thirtyfold, or sixtyfold, or a hundredfold. Christ Jesus declares that it is every hearer’s heart (“good” soil) that determines how much of God’s sown Logos Word (SEED) it will both receive and apply. For this reason Christ Jesus, the Sower, points out that His sown SEED always has the potential to reproduce Itself, because IT contains Life within Itself. However, the Lord also makes it clear that it is only when His Word SEED is sown into “good” soil or a receptive heart that is maturing in a very healthy nurturing environment, both naturally and spiritually speaking, that His sown Word SEED will reap a continual and abundant/generous harvest. Now, while Christ Jesus doesn’t say it in any of His SEED parables, both the writer of the Book of Acts and the apostle Paul teach that a person with the “good” soil or receptive heart produces an abundance of spiritual fruit when this person participates in a spiritual community of believers (i.e., an ekklesia)—the necessary nurturing and loving spiritual environment. It is important to re-emphasize here that even though a seed is alive (has life within itself), before a seed can produce after its own kind, it must be sown/planted and then nurtured. This natural truth is why in the Parable of the Sower the Lord makes it clear that even His spiritual SEED will stop growing when IT is planted along the edge of a well-trodden path, or in shallow ground, and/or if IT stops receiving the proper spiritual nourishment. What Christ Jesus also finds important to point out about His sown SEED is the fact that when more SEED is sown in “good” soil, in a receptive heart, that person’s harvest will be larger. This Divine Truth is what He is drawing attention to when He says that some harvests are thirtyfold, some sixtyfold, and some a hundredfold. As previously stated, throughout the Word of God, either Father God or Christ Jesus is teaching that a continual and generous harvest only happens when people sow continually and generously. The apostle Paul also teaches this Divine Truth, as well as confirms what Father God and Christ Jesus essentially mean, when Paul writes: “But this I say: He who soweth sparingly shall reap also sparingly, and he who soweth bountifully shall reap also bountifully” (2 Corinthians 9:6, KJ21). Once again, a seed produces after its own kind, and a seed has life within itself. For these reasons, without doubt, it is God’s spoken Word SEED that produces His Word in the flesh (produces the manifested seed of a woman, who is Christ Jesus, the spiritual SEED/Son of God). Likewise, it is Christ Jesus’ spoken Word SEED that produces a Body of Believers (God’s adopted sons and daughters). Therefore, those individuals who are the Lord’s faithful followers or believers, who have a spiritual desire for the Word of God (SEED) to produce after their own kind, not only must continually plant the Word of God (SEED) in their own hearts and minds, but also they must plant the Word of God (SEED) in the hearts and minds of lost souls and doubting believers. As it already has been mentioned, Father God and Christ Jesus both teach in the Word of God (the sown SEED) that just like God’s spoken Word (SEED) has Life within Itself, the same is true about the words humans speak—their words have life within them, too. What hasn’t already been mentioned however is the fact that humans’ spoken words also could have death in them. Indeed, the writer of the Book of Proverbs says: “Death and life are in the power of the tongue, and they that love it shall eat the fruit thereof” (Proverbs 18:21, KJ21). This proverbial wisdom is why orally speaking God’s Word (SEED) is more than relevant. Speaking God’s Word (SEED) with the mouth is undeniably vital, because it is only by speaking God’s Word (SEED) that Life is produced instead of death. Furthermore, after Christ Jesus’ faithful followers or believers daily plant His SEED in their own hearts (spirits), after they speak God’s Word (sow the SEED) every day into their own hearts, this sown Word (SEED) eventually will affect the way their mind thinks. As a result, Christ Jesus’ faithful followers or believers will receive the harvests they have purposed in their hearts (spirits). Likewise, where unbelievers (doubters) and nonbelievers are concerned, Christ Jesus’ faithful followers or believers also are planting God’s SEED in others’ hearts (spirits) and minds when the Lord’s disciples are speaking God’s Word to others (sowing the SEED). That spoken SEED (Word) which takes root not only has the potential to affect the way other people’s minds think, which ultimately could result in an increase in the Lord’s Harvest of souls, but also that spoken SEED (Word) has the potential to cause the faithful followers of Christ Jesus to end up fulfilling their spiritual desire to produce after their own kind—to become spiritual parents! The bottom line is that every possible seed begins with God, who is the eternal spiritual SEED. For this reason, the never-ending cycle of seedtime and harvest will have both a natural and spiritual outcome. Spiritually speaking, the Word of God is His SEED that must first be planted in sinners’ hearts before they can become faithful born again, saved, and sanctified followers of Christ Jesus. The apostle Peter confirms this Divine Truth, because he writes that followers of Christ Jesus, or believers, are “…born again, not of corruptible seed, but of incorruptible, by the Word of God which liveth and abideth for ever” (1 Peter 1:23, KJ21). Lastly, from the above words spoken by apostle Peter, it is obvious that God’s Word is the spiritually sown SEED. This Divine Truth also means that God’s SEED created all seeds, all natural seeds and all spiritual seeds. What is equally important in the above cited verse from First Peter is the fact that apostle Peter is making it perfectly clear that ONLY God’s spiritual SEED (His Word) is an incorruptible SEED. Apparently, because of human interference and/or the lack of a nourishing environment, it still is possible for some natural seeds to become corrupt, even though natural seeds come from God’s eternal spiritual SEED (His spoken Word). This last point just proves, once again, that ONLY God’s Word SEED is that incorruptible SEED that has everlasting Life in It. That’s why, without doubt, it is God’s Word SEED that produces after Its own kind, reproducing an infinitely abundant Life in those hearts (spirits) that have received and are applying His immortal Word SEED. So then, because the Word of God (SEED) is everlasting, this is the reason why ONLY the Word of God (SEED) produces a continual and generous harvest, which is something that money could never do! That’s why money is never the biblical SEED that God says is sown during seedtime. God Himself is the sown SEED, and the SEED metaphor most often used to describe Father God is the Word of God! WONDERFUL! Loved it! So on time for me and a team of intercessors as we are eating from Ruth this week! As God prepares us to glean with the harvesters in the field of great harvesting promises, Boaz (Jesus) looks and asks, whose girl is that; she will then go from the being a field-girl into the house as a virtuous wife! (damsel-young and tender grounds or soul that is fertile & highly productive; childlike; obeying and trusting, never doubting, moldable). May God be praised! I thank Him profusely for trusting me with His Divine Truths about His SEED. He indeed is an on-time God! I thank you for your kind, loving, and encouraging words, my dear sister in Christ. You indeed speak “life” into the work God has given to me to do with this blog. Thank you too for inviting me to join your Facebook prayer group. Unfortunately, right now, joining any Facebook groups is not something I am being led to do. Many blessings to you, to all of your loved ones, and to your Facebook prayer group, as well. Praying your group’s gleanings will be abundant . . . . Thanks for your thoughts on seed. We read in 21st Century Science and Health, “The seed within itself is the pure thought emanating from divine Love, Life.” The seed within exemplifies eternal life. Wonderful things to contemplate! Thank you so much for visiting this blog, reading “God’s Metaphorical Seed,” and commenting on said blog entry. I have to say, however, that I neither have read Mary Baker Eddy’s Science and Health… (1875) nor your 21st Century Science & Health with Key to the Scriptures (2009). Thank you Bishop Prince. Amen indeed! The Word is the Seed. Amen!